Preheat oven to 220°C/430°F. Peel and finely chop garlic. Add garlic, olive oil, and zaatar to a bowl and stir to combine. Halve and score eggplants crosswise. Season with salt and pepper. 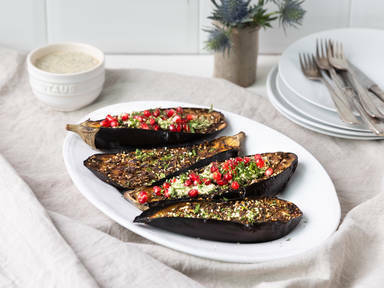 Transfer halved eggplants to a baking sheet cut side up and rub the zaatar mixture on top. Bake at 220°C/430°F for approx. 45 min. In the meantime, finely chop parsley and mint. Add chopped herbs, tahini, unfiltered apple juice, and lemon juice to a bowl and stir to combine. Season with salt and pepper to taste. If the mixture is too thick, add a little water to help reach a creamy consistency. Remove roasted eggplants from the oven and serve with tahini dip. Garnish with pomegranate seeds, fresh parsley, mint, and sesame seeds. Enjoy!